NPA personality theory: The R score and "disordered thinking"
The R score and "disordered thinking"
Below are results of the NPA personality test for a series of 50 random numbers. The computer output is character type NA- with a moderately high S score of 42. The highest correlation coefficients correspond to N and NA-, with negative correlation coefficients for PA and A. The Temperament score is moderate (29) and the Focus score is low (35). The Aggression score for overt aggression is a low value of 19. (The aggression score measures aggression in relation to a hypothetical dominant A type). We ran a set of random numbers by the NPA test 30 times, and interestingly enough, the computer algorithm invariably chose "NA-" as the diagnosis for the NPA personality type. In other words, the algorithm identifies "totally disordered thought" with the NA- personality. Granted, in almost all of the cases the result was flagged as "poor consistency" (consistency coefficient C1 of zero, or close to zero). Nevertheless, the computer output was unequivocal, rather than saying "no result" (which occurs in about 1% of the tests that we receive). To characterize NPA tests that are identified as "random numbers" we devised a "randomness coefficient" (R), which is now added to the NPA test readout (R=23 in the above test). On the basis of the 30 tests, the mean R value for random response was 39 with a SD of 11, so values of R > 60 are rare for random response. Conversely, tests that we receive from human internet subjects rarely have R values < 60. The last possibility is interesting, since certain psychiatric diagnoses are associated with disordered thought processes. These would include schizophrenia, of course, but might extend as well to borderline personality, ADHD, autism spectrum, panic disorder, bipolar I disorder, phobias, etc. So the NPA test has a new "tool", and it might be interesting to see how frequently various diagnoses associate with low R value (less than 60). 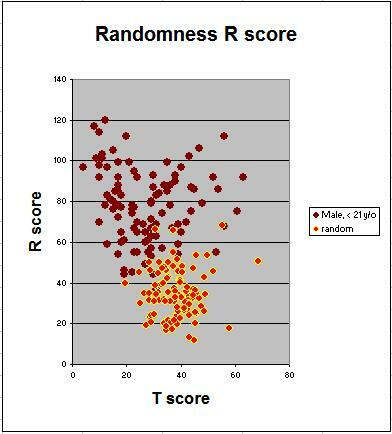 Below is a plot of R score vs. F score (English tests, no diagnosis or disorder indicated), showing some degree of overlap between actual test results and a sample of 100 tests where random numbers (from 0 to 4) were used. The plot tends toward a V shape because N types with low F-score and perfectionist types with high F-score tend to have high R-values (excellent agreement with the "standard tests" on which the NPA test is based). It should be interesting to see if categories like borderline personality, ADD, etc. show different degrees of overlap with the "random region". We should reiterate that a test in the random region does not necessarily indicate "a disordered mind": there are many other reasons why a test can fall in this region, and we will from time to time look at individual tests to try to ferret out what the test is trying to tell us. Almost all of the "random" tests were interpreted as NA/NA- by the computer algorithm: there were only a few such tests that were read as N or N/NA type. The NPA personality test easily computes scores for Aggression, A and Narcissism, N ("sanguinity") based on correlation coefficients. In the past we have not displayed the N score because of the subtleties inherent in its interpretation (in particular, the N score is modulated by aggression and reaches its highest values only in N types). However, since interest has been expressed regarding potential use of the NPA test specifically to investigate "narcissism", we now include the N score as well. The image below illustrates the updated display of the online test for a subject who tested as "PA", or perfectionisitic-aggressive. Of note is the exceptional R score. 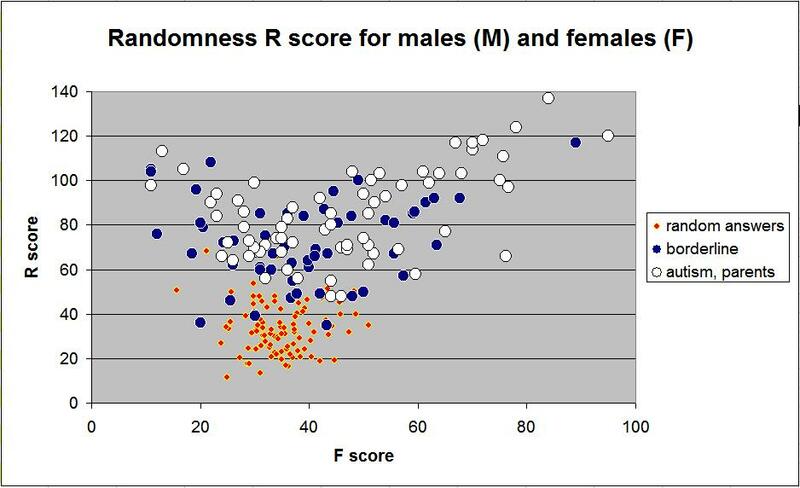 Bipolar subjects tend to have R scores averaging only slightly below the general population of subjects (results to be presented). Following up on our posting of Dec. 17th last, below are results on an R-score/F-score plot for 26 subjects who self-reported schizophrenia (SCZ) on the internet NPA personality test. 2. very likely the SCZ subjects taking the internet test are very high-functioning in comparison to the greater population of individuals with SCZ. Yes, it does look like a trend toward low R-score nevertheless in SCZ patients. I chose to plot against F-score because the data are more spread out along the X-axis, with non-perfectionist types at the left and NP and PA types on the right. So, if a malevolent, evil alien force tried to sabotage our data base by submitting 100 randomly-answered tests (almost all of them testing in the category of "NA-"), they might have succeeded... save for the R score. The R score is the maximum correlation coefficient "r" between the subjects responses and all of the standard tests plus the SD. 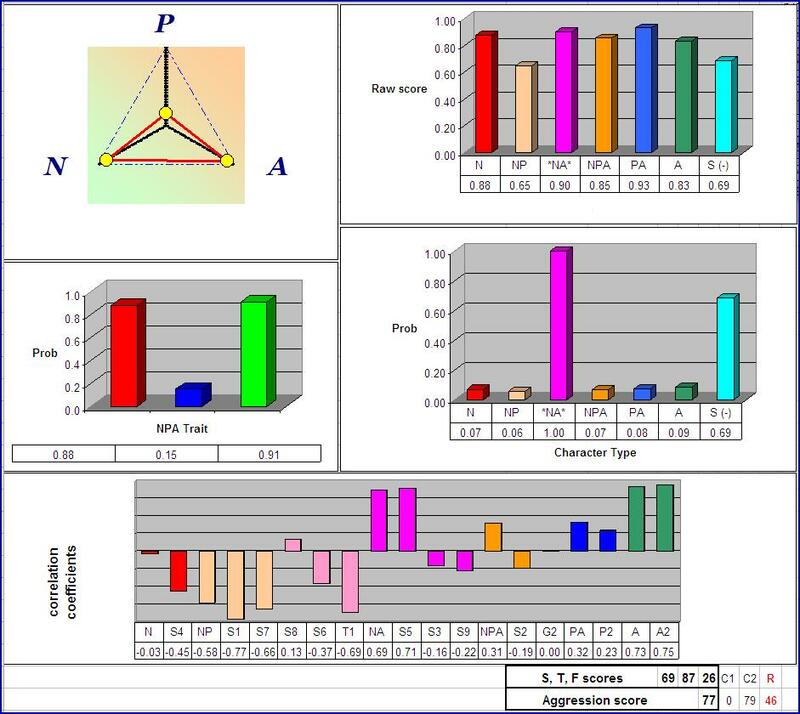 The C score is the average correlation coefficient pertaining to the five statistical methods used (see p.2 of the English version of the NPA personality test). Not surprisingly, the Borderline (English), NPD and ADD groups were low on the R-scale, while Autistic child (parents), Asperger/autism, and OCD were near the top. 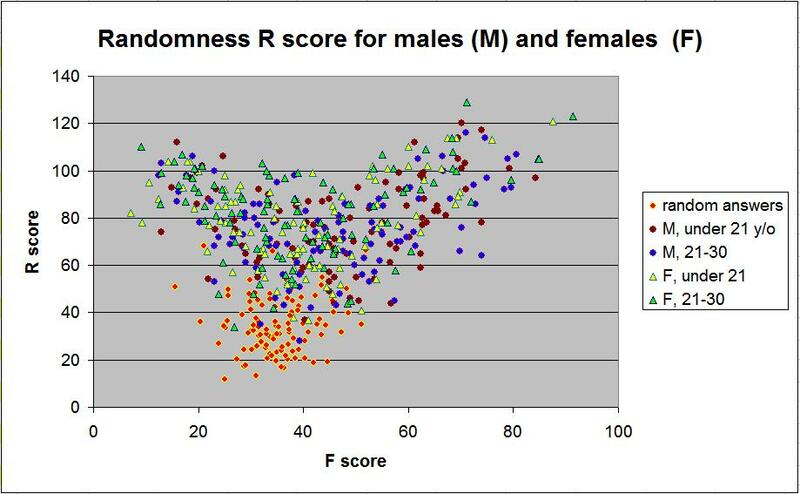 Both English and French females scored more coherently than the males (no comment there!). 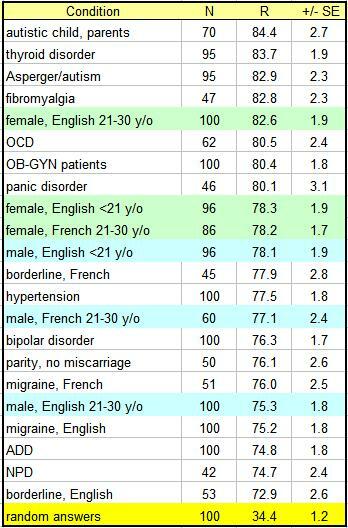 Not easily predictable are the relatively high scores for Fibromyalgia, Thyroid disorder, Borderline (French), as well as the lower scores for Migraine (both English and French). 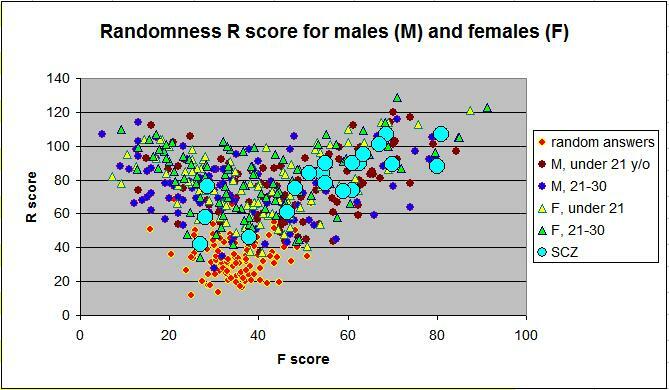 In general, tests scoring NA or NA- in the "moderate" region of F-score trend toward lower R-score. The plot of R score vs. S score has something of a V-shape mainly because N types (low F score) and Perfectionist types (high F score) tend to have elevated R scores (high coherence). One could argue that this result is just an intrinsic result of the NPA test itself, with the test identifying clear-cut N types on the one hand, and Perfectionist types on the other hand. This could be partly true. Nevertheless, randomly-answered tests ("disordered mind") fall in a clearly-defined region of low R-score, and the test usually gives the result of "NA-" type for those tests. Conversely, we found that the ADD group of internet subjects (who one would a priori predict would have disordered response) did indeed have one of the lowest mean R-scores of all the groups. The plot of "ADD vs. autism, parents" showed significant overlap between the two groups. Hence, the result of the NPA test's indicating that ADD subjects tend to have a more disordered response ("lower coherence") would be valid only in a statistical sense, and it could not be applied to any individual subject. In general, one could say that a high R score rules out a highly-disordered (random) response to the questions on the test. Conversely, however, for a low R-score one could say only that the test is consistent either with a disordered response, or an unusual ("exceptional") response, and for an individual test one should not leap to the conclusion that the former is the case. With regard to the quantitative value of R, the value of 57.5 delineates rather well randomly-answered tests from actual tests: 95% of random tests have R below this value, while over 95% of actual tests have R above this value. The randomness R score is "model-dependent", that is dependent on the particular algorithms chosen for the NPA personality test. For a particular NPA test, the answers can also be tested for random response by the "model-independent" chi square statistical test. 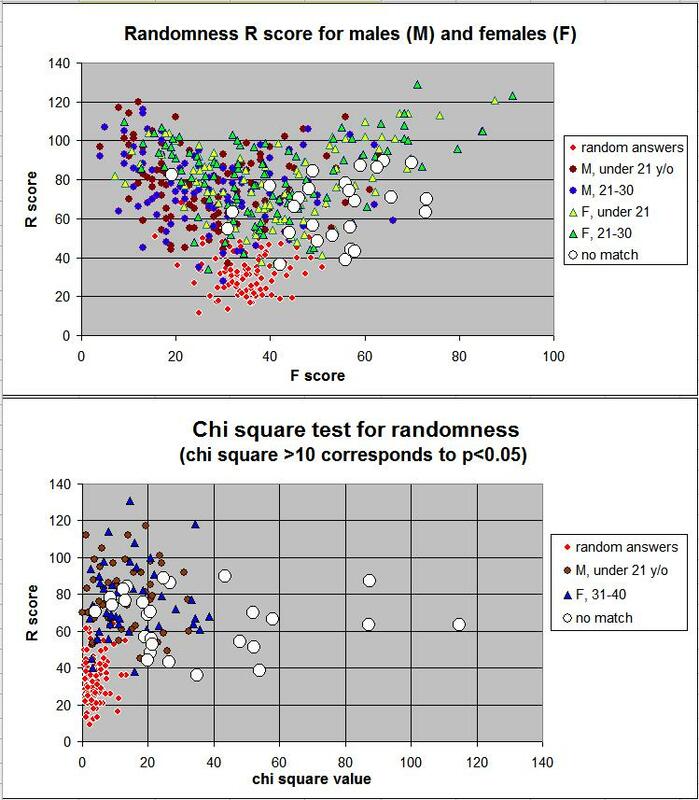 * Below are 100 "randomly answered" test results (by random number generator), compared with 100 actual test results, where we have plotted the R score vs. the chi square value. The results are scaled so that a chi square value >10 corresponds to p<0.05, with a null hypothesis of no difference between test results and expected results based on a random response. 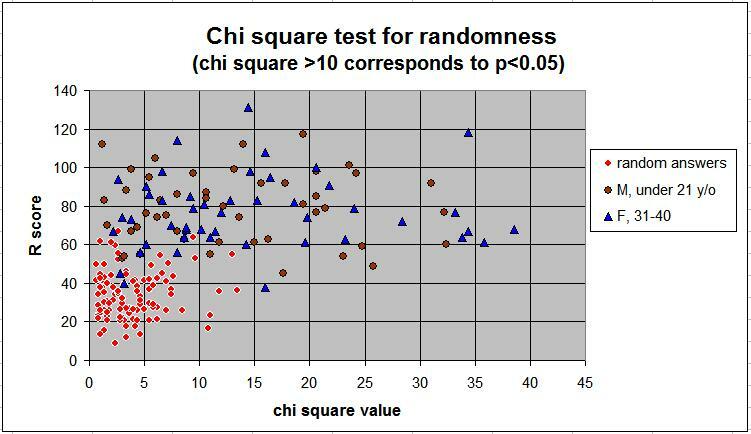 As one can see, there are many actual test results accepted as "random" by the chi square test (chi square <10, false positives), even though they are clearly non-random by the R score (R>60). So, the R score (R<60) is better than the chi square test in signaling a test result that may correspond to a random response, or for an actual test result, possibly "disordered thinking". 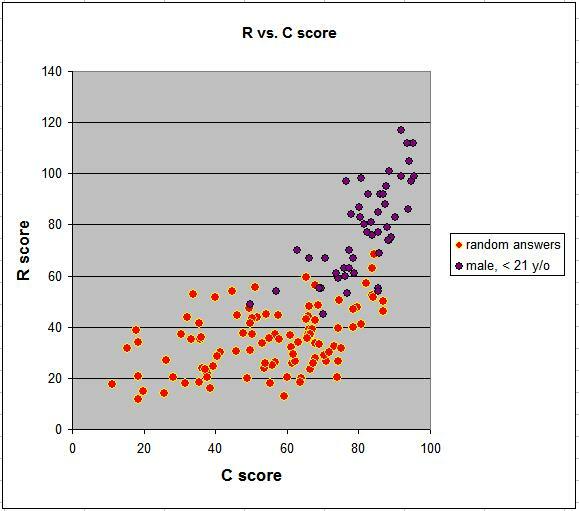 Using both scores, one can see that region of true random response corresponds to a limited region confined by (approximately) R<60 and chi square <10. One would expect that the model-based test of randomness (R score) would be better than the non-parametric chi square (chi2) test, but this is not always the case. One can see that although there are tests with low R score and there are tests with low chi2 value, there are no tests with both (R<60 & chi2 <10). So, the "no match" NPA tests are exceptional tests, but they are not randomly responded. To reach this conclusion, one needed the both the R score and the chi2 score, so both are useful. There are many possible reasons for the rare "no match" tests, some related to the test itself and some related to the subject. For a given test, there is no way of knowing the exact reason, although from the gender, age, diagnosis, comments, and examination of the individual answers to the test, on could hazard a guess. "No matches" are uncommon also for the randomly-answered tests: out of 100 such tests, only one was a "no match". So, there is virtually no overlap between randomly answered tests and "no match" tests. 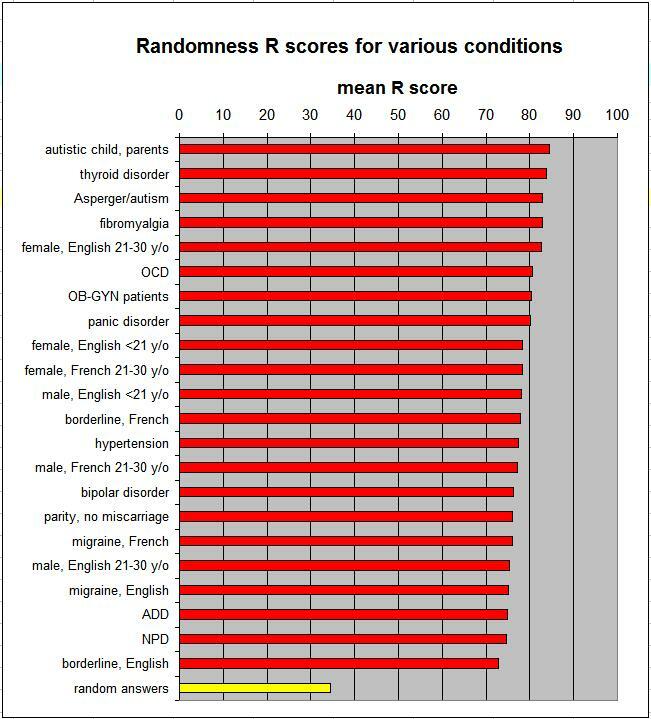 However, we do get occasional actual tests (see below) that fall into the random region (combined R score and chi square criteria), with most of these getting the computer diagnosis of NA- type. 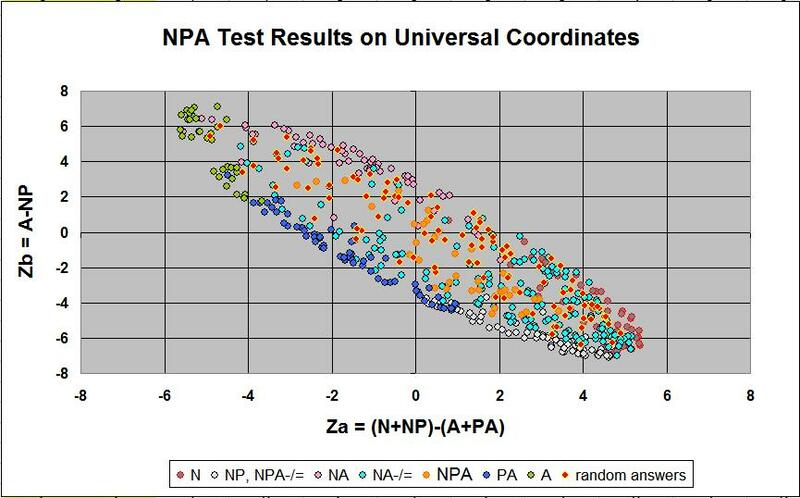 So it is interesting that the computer algorithm of the NPA test associates random response with the presumed NA/NA- phenotype. Given that the "borderline", "NPD" and "ADD" groups of internet subjects had the lowest R scores – with frequent NA/NA- types in these test categories – our hypothesis would be that the NA/NA- group of patients should be studied for correlation with dyslexia and other disorders of cognition, as well as with disorders of impulse control.